Did you know that the State of Rhode Island and Providence Plantations (defeated ballot amendment!) holds the distinct honor of maintaining the highest percentage of Portuguese population in the country? From a culinary prospective, that’s a huge advantage. Our little state is an ethnic restaurant powerhouse in the Portuguese arena. The Rhode Crew was fortunate to be joined by our friends Rose and Judy for this meal. Both sisters are first generation Portuguese Americans and had recommended O Dinis for our review. Once Rose and Judy began ordering for us, we just sat back, tucked in a napkin and let the adventure unfold. For those of you who are without Portuguese friends to help navigate your culinary waters, it about time you started looking! 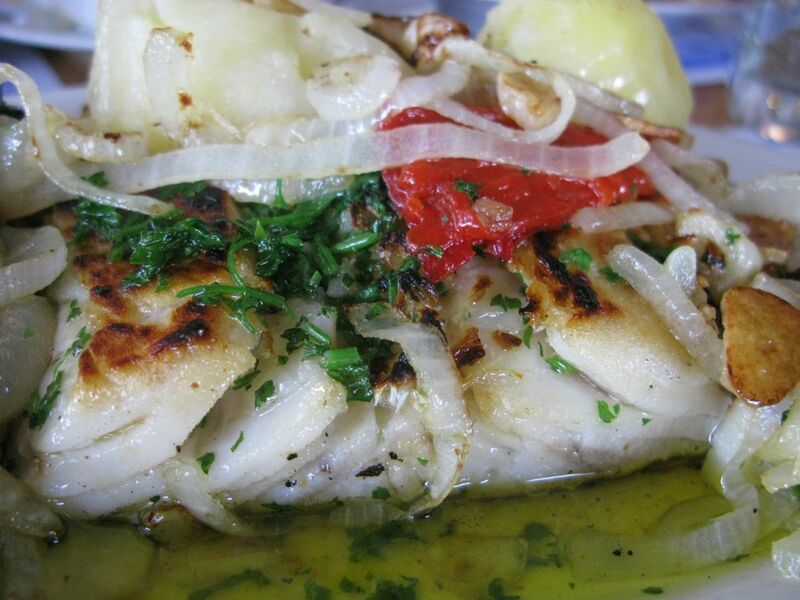 Bacalhau na Brasa ($14.95) Grilled salted Cod with boiled potatoes topped with garlic and onions sautéed in olive oil. The fish texture was smooth, white, firm and perfectly executed. This is an excellent menu choice that must not be overlooked. Carne de Porco à Alentejana ($13.95) – Marinated Pork and fried potatoes with steamed Littlenecks. This was a great dish. 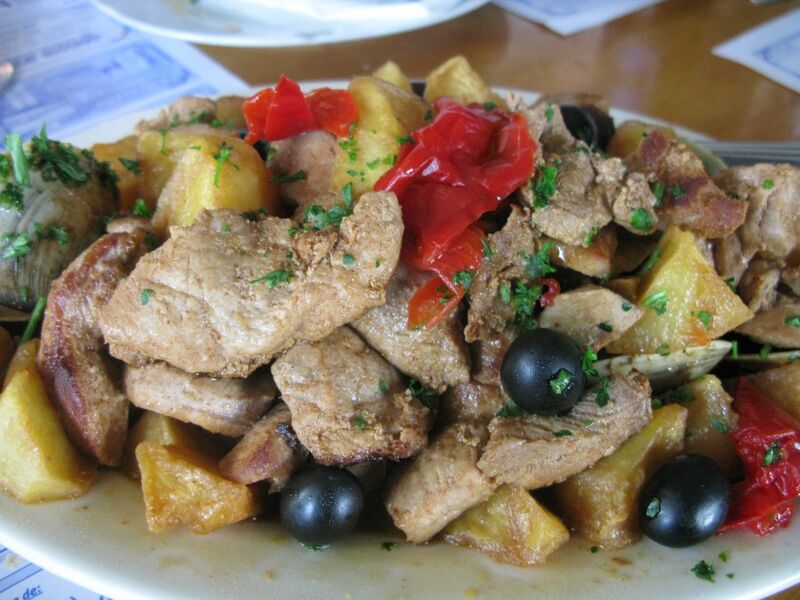 You can’t go wrong with the ingredients: marinated pork, potatoes, littlenecks, whole olives and roasted peppers. There was no skimping on the marinated pork as the picture will attest. Everything worked well together. We’ll admit that our experience with this dish is limited and believe that the correct tenderness of the pork could have been a touch more tender. Still, this dish was very good and a great value for under $15. Espetada de Camarão e Lulas ($13.95) – Grilled Shrimp, Squid and perfectly charred peppers on a Kabob. Ours came with sliced squid – instead of rings, the squid pieces were the ends of the squid tube –obviously much easier to skewer! This was all served over a bed of rice in the phenomenal shrimp sauce (a light red, garlic and lemon concoction). Everything was tender and not overcooked. Watch out for those shoestring fries, they’re very addicting! 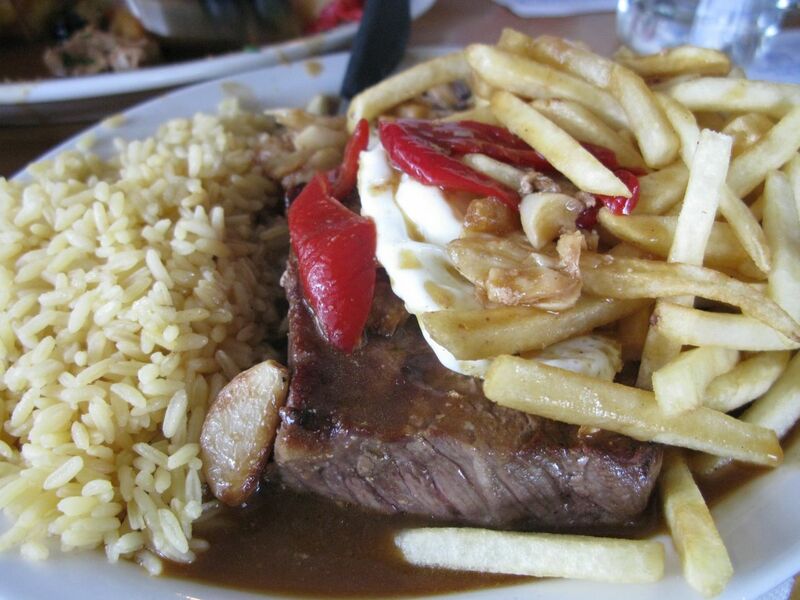 Bife à Casa ($13.95) – Pan-Seared Sirloin steak in a beer and garlic sauce served with French fries, an egg and rice. Our only issue with this dish was that we had to share. There’s only so much egg you can savor with steak when you’re sharing with 5 people. Regardless, we were very impressed with the portion size and the thickness of the steak. It had to be greater than a half inch in thickness and the tenderness was perfect. We have had quite a few ethnic steak dishes priced around the $10-$15 range and most were ¼ to 1/3” in thickness and usually on the well-done side. The brown sauce was a great compliment to the dish, only enhancing the elements and not overwhelming the main attraction. We ordered a superb Portuguese red wine – Quinta de Cabriz – Dão ($16.00) which was well balanced, full fruit, and aromatic. 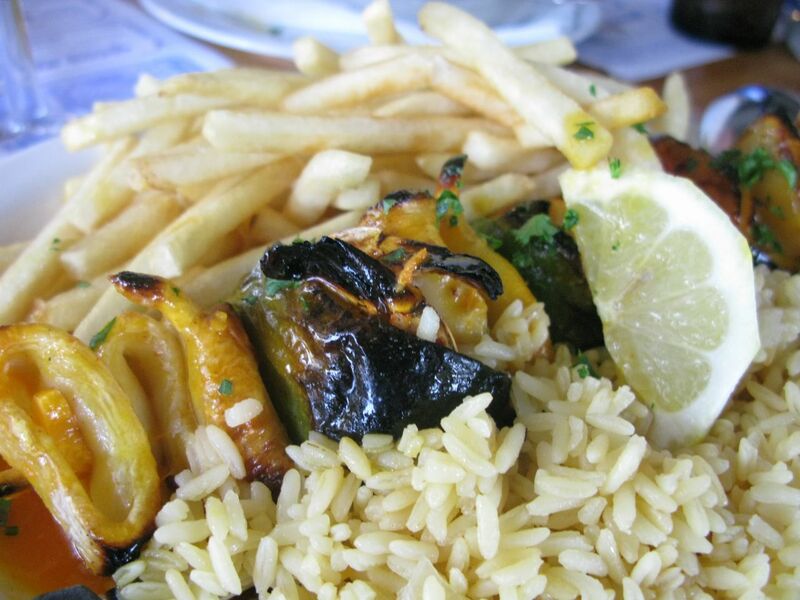 A escolha perfeita para acompanhar o nosso almoço (The perfect choice to accompany our lunch)! 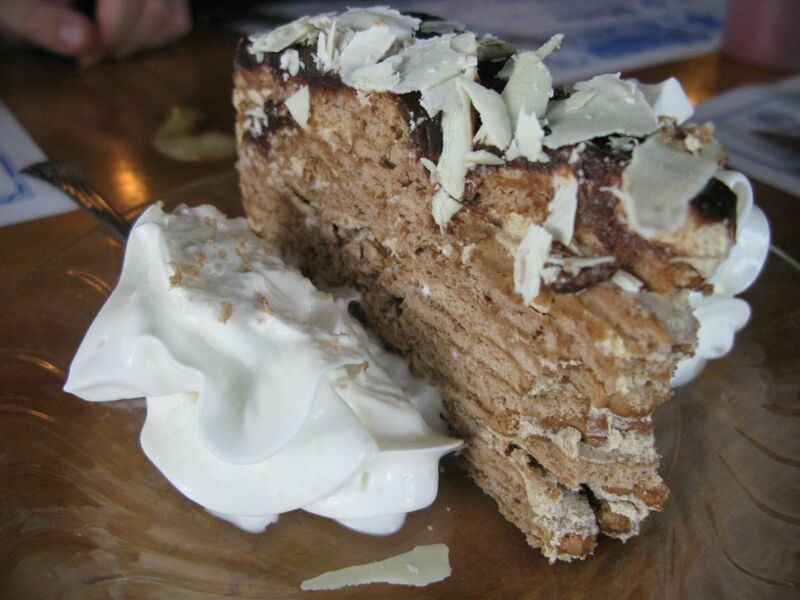 Our waitress Isabel (Queen Isabel – as she requested we address her) advised us that all the desserts on the menu were terrific, and judging by what we ordered, the “Queen” may have been right all along. 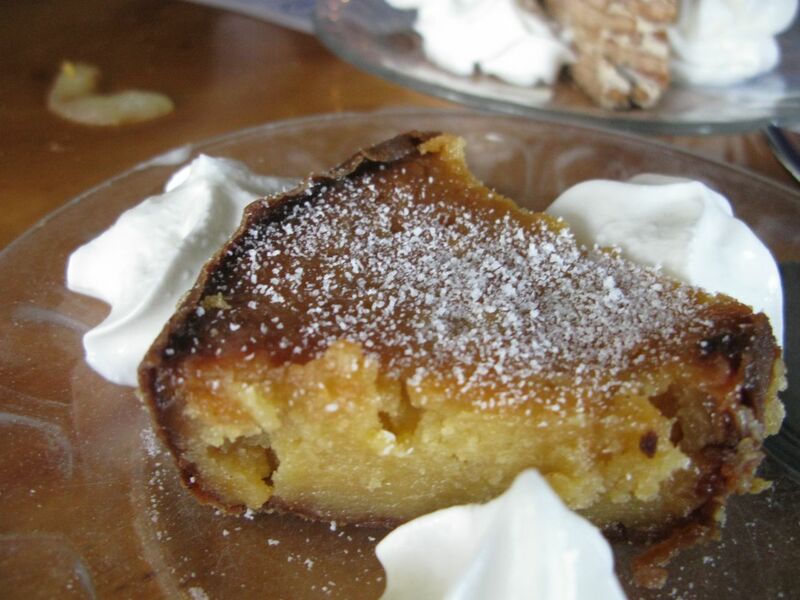 The Bolo De Bolacha (Portuguese Cookie Cake) which included Maria Brand Biscuits, butter, sugar, coffee all baked into a very delicious dessert choice. Additionally we ordered Queijadas de Feijao (Portuguese Bean Tarts) which were absolutely a favorite. This pie was sweet, dense, and rich with hints of caramel throughout. This entry was posted in Portuguese, rhode island food and tagged Bacalhau na Brasa, Bife à Casa, Bolo De Bolacha, Carne de Porco à Alentejana, east providence, Espetada de Camarão e Lulas, Portugues Restaurants in East Providence, Queijadas de Feijao, Quinta de Cabriz - Dão, Rhode Island Portuguese Restaurants, Rhode Island Restaurant Reviews. Bookmark the permalink.